So apparently I’ve been yammering on and on about needing an assetgraph for over two years, and it shockingly STILL doesn’t exist. So, I’ve been exploring what we need to do to make a super simple application that could be plugged into Facebook (or really any social network) so that we can make value visible more easily. For starters, what types of assets do we want to see? They further break down these three levels into six types: individual, institutional, organizational, governmental, physical/land, and cultural. So, my thoughts are that these same techniques for self-mobilization and organizing for change at the local level would work for Creative Economy 3.0. Efforts to strengthen civil society. These efforts have focused on how to engage people as citizens (rather than clients) in development, and how to make local governance more effective and responsive. Donnie MacLurcan of the Post Growth Institute has assembled a nice guideline for how to facilitate an asset mapping exericse, using a “head / heart / hands” framing. I installed the free Pomodoro Daisuki app for Chrome, and have been messing with that to demonstrate this exercise online. While this is nice in terms of visualizing your own assets and capacities, there would need to be collaborative functionality and some kind of meta-tagging system so that this information would be pooled into a database and then presented back to you as a location-based data visualization, so you can see who in your community has what and where. There also needs to be a trust network/reputation layer, because you’re not going to offer all your assets to everyone all the time. The big issue I’m finding with individual asset/capacity mapping so far is that many of us (myself included) aren’t completely clear on what ours are or how to best identify/surface/recognize them. So no amount of technology is going to solve that problem. Now, the next level up is assets at the organizational, then institutional levels. As a specific use case for a nascent “Resilient City Project,” I’m in talks with people from my area here in the Hudson Valley, NY, people in Detroit, in Vermont, and in Montreal. The idea is to map out social enterprises, farms, and their supply chains, so we would have a transparent Eastern Corridor assetgraph, and could begin building business-to-business exchange networks up and down the East Coast. I just discovered localwiki (ht @ryandeussing), an open-source wiki tool for mapping. It may be useful as a first step to this mapping project. I also found sourcemap last year, which is open supply chain mapping. So you can imagine how mashing up these tools can quickly help us map our regional resources, in addition to surfacing our individual ones. 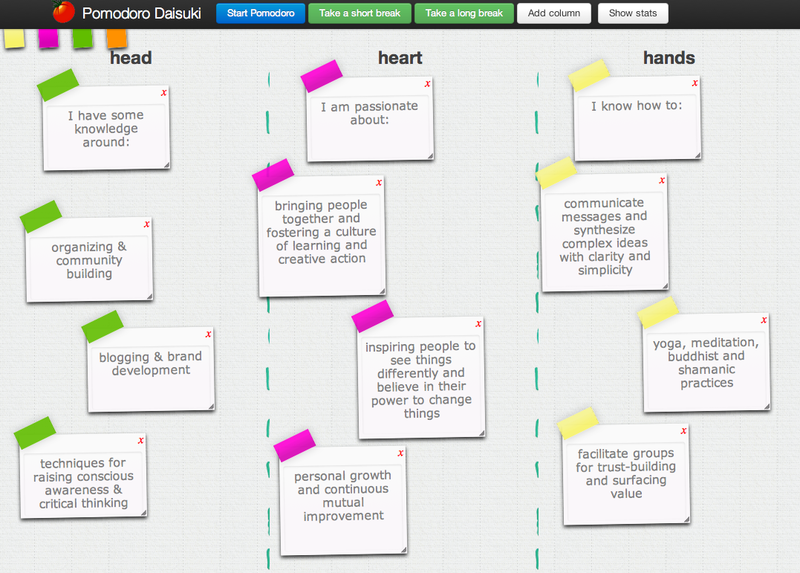 After all this is mapped, we then need to bind that with the needs of the community….. and what do we have? Matching unmet needs with unused resources = Creative Economy 3.0 Marketplace. Really enjoying the unfolding of your thought and the precision built into each step. I work with storytelling as a tool to pull business organisations together, to realise themselves as actors in participative community. Storytelling is then used as a method of investigation to see what binds these people in common, and collectively where do they wish to go. There’s also a step that moves people into considering why they really exist in such a community, so ensuring full participation, from the stomach if you will. I’d be happy to share a methodology of the workshop if it would help your thinking. I’m really interested to see the integration of physical assets and mapping of current strengths as a contribution to this conversation. It’s something I could consider for future work, at present I’m relying on the knowledge being present in the group. i would love you to share a methodology! as a matter of fact, if it’s shareable to the public, i’d like to add it to our Open Foresight library. Open Foresight is a project i started last year, to compile a library of resources, tools, methods, and practices for creating visions of the future together. essentially taking a lot of ‘thinking tools’ from the futures studies field, design thinking, storytelling. and then people could submit their stories so we can collectively start building a shared vision of the future, or at least many emerging narratives, to inspire us to take action NOW. anything you contribute will include attribution. Hey, That’s brilliant, I’ll send it along. It needs a little work to make it presentable for general use (it’s currently tailored to clients). Hope it can further others’ work, and be great to receive insight and feedback on it. Are you aware of the mapping project of New Economics Institute in Great Barrington MA and NYC? I just learned something about it recently from Susan Witt. I publish KOSMOS Journal and am following your work. Bravo! no, not aware! would be great to team with them. do you have a link? http://www.new economicsinstitute.org. This is an outstanding group you will surely like to know about. the key person is Susan Witt. I just set up knod.es so I can search my Twitter, Facebook and LinkedIn network for info by keyword. It doesn’t allow for serendipitous discovery but it can help me find who in my network knows about a specific topic. I see asset mapping as part of the due diligence necessary for taking account of capital. It’s all about accounting and accountability. If we’re going to move beyond financial currency being the primary accountability metric, we’re going to have to innovate methods and tools around accounting for capital in all its forms. Behind this technology we have this concept of the ‘social graph’ which is the data that allows us to map social networks and visualize them. 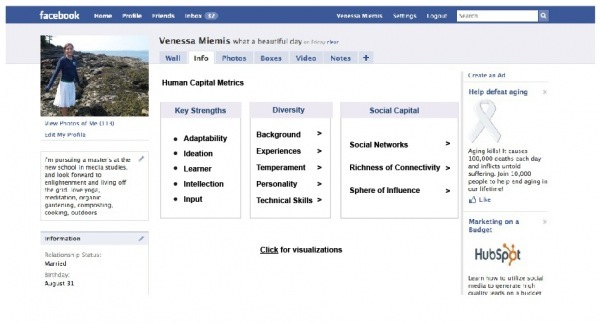 Now Facebook is taking things to the next level with their ‘Open Graph’. Not sure how open it is.. but it looks to be a step closer to enabling general asset mapping innovation. I’d like to explore the idea of the ‘asset graph’ (an open and distributed data markup/semantic web standard/cloud service thingy) and the ‘asset map’ which is how that data is represented and interacted with. Separating these two concepts out enables us to conceive of Asset Mapping as a dynamic exploration space that’s both real-time and collaborative. IMHO, the natural evolution of social web as the basis for a ubiquitous computing ecosystem that maps closely to and evolves with our existing mental models. of course. do you have any suggestions? I understand the purpose of mapping human assets, (ahem, not the right word for me, sorry) as: how can we learn about each other enough and fast enough – the few we have the bandwidth to select at least? And for what? My purpose for the connection is my key input to make an assetmap useful to me. Mapping and rating are reductionist techniques used in complex and bizarre domains. They may add value if they help build trust, channel useful information, and accelerate the network effects that help augment each others’ capabilities to get shift done. Some of the mapping techniques by Irene Ng might offer an approach. I have the same feeling as @martinking but I trust your brilliant mind to keep the focus on “social capital”, “culture”, “collaboration”, “creative economy”, etc. rather than neuro-connectionist-like brain asset mapping. One avenue I have explored in the mid ’90 is in the world of disabled-people (being one of them), see MELBA in Germany where the asset mapping is mostly focused on hands/heart capabilities rather than brain capabilities. Mind that disabled people have different referents for ‘sociality’ than ours. Yet, with an ethnographic mindset, and (why not) the support of some of their methodologies, it should be possible to achieve the highly desirable goal you set yourself in 2009. I noticed that your suggested facilitation process is in line with the objectives and an ethnographic approach. There are some potential pitfalls, even coming from the mere technologies we rely on to materialize the ‘human capital mapping’ with a social stance i.e. ‘mediated’ social networks. Following works of such people as Lakoff or Churchland, we tend to see human being as not being shaped by culture or driven by our social experience. “… the individual becomes like a node in a network …” , “…a person comes to be made up of a flexible collection of assets; a person is proprietor of his or her self as a portfolio …” (E. Martin : “Fluid Minds”). Hence, which technologies should we use to carry out the mapping without falling in the trap of the very limited view of human being advocated by “connectionist” that relies on that same technology ? Anyway, I find that this exercise is key for raising the awareness about ‘creative economy’, because production (in a very broad term) is not any more a collective or social process to be maintained in and through technology and engineering knowledge; it is rather a creative process to be maintained in and through social networks and social capital. Let’s remember C. Geertz “The human brain is a product of a relation with culture” (not a product of relation with a node in a network). Can I ask who you believe needs it? There are socially entrepreneurial types in communities who are already getting things done. 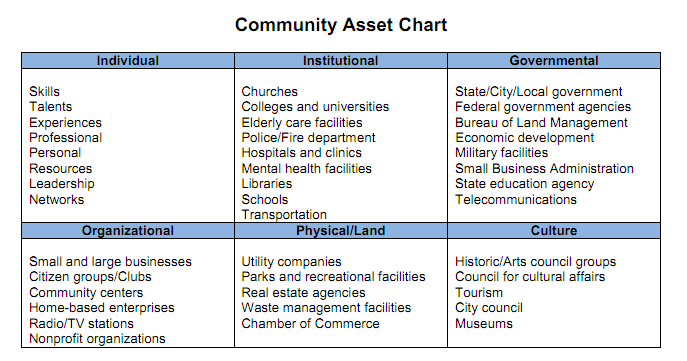 Would an asset map facilitate their efforts? Have they asked for it? Or are you hoping to motivate those on the sidelines by virtue of unearthing hidden informational value? i believe *I* need it. i’m trying to help myself and people within my local community to bootstrap our efforts. we have a lot of people trying to do a lot of things (launch a food coop, which i’m working on (beaconfoodcoop.org), a people’s newspaper (our ning group at beaconcitizen.com isn’t the proper forum for that), a local radio station, a shared tools library, and i can list 15 other initiatives. it goes on and on. these things can’t be accomplished in isolation, and organizing is currently very tedious and long work. if we had better ways to expose our intentions and the assets we’re willing to share with one another to one another, we could all advance our goals faster. Hi Venessa, thanks for the response! This is key: “if we had better ways to expose our intentions”. Projects embody beliefs. People with the right assets will rally to the project if they believe what you believe. Communicate the ‘why’ of the project. Then communicate what you need. Belief drives the need, and the need determines the assets necessary to make it happen. Map the projects, not the assets. What are your thoughts are LinkedIN and their approach to Collaboration groups? I enjoy reading about your ideas, many of them follow my own thought patterns. I comment when I like a article on a website or I have something to add to the conversation. I looked at. And after this article How Do We Harness the Innovation Potential of our Networks? and the smell of nicotine, which mimics the tobacco. on the field because very rarely an unknown will win. buy a digital T shirt printing machine. If you are familiar with the fitness world, you must already be aware of the P90X program. Great site you have got here.. It’s hard to find quality writing like yours nowadays. I really appreciate people like you! Take care!! week without having to look at a single recipe. Hay-Morning bby Supercell is liberated too generate during the Appstoore for your smart phone or iPad. I’d no issuhes applying along with the generally game was free off charge. I’ve also have nno complications with accidents or problems. The complete game requires 38.4mb of home. This app is improved upon ffor new iphone 4-5.
utterly functional without any creatinmg any acquisitions. Hurrah! At last I got a blog from where I can really get helpful information concerning my study and knowledge. drab looking paint that is especially made for glass. created in 1913, is” Midnight Black Wolf” that depicts a man who resembles Mr.
in 1863 to help preserve the Union. Hi, I do believe this is an excellent website. I stumbledupon it 😉 I may revisit once again since i have book-marked it. Money and freedom is the best way to change, may you be rich and continue to guide other people. ingredients that I need to buy. Place a short announcement in your organization’s next newsletter. Microwave oven is one device that has defied the clock in the kitchen. Awesome blog! Do you have any tips for aspiring writers? I’m hoping to start my own website soon but I’m a little lost on everything. Would you suggest starting with a free platform like WordPress or go for a paid option? There are so many options out there that I’m completely confused .. Any recommendations? Appreciate it! First off I would like to say fantastic blog! I had a quick question that I’d like to ask if you do not mind. I was interested to know how you center yourself and clear your mind before writing. I have had a hard time clearing my mind in getting my ideas out. I do take pleasure in writing however it just seems like the first 10 to 15 minutes are wasted simply just trying to figure out how to begin. Any suggestions or tips? Thanks! With havin so much content and articles do you ever run into any issues of plagorism or copyright infringement? My website has a lot of exclusive content I’ve either created myself or outsourced but it appears a lot of it is popping it up all over the internet without my agreement. Do you know any methods to help stop content from being ripped off? I’d truly appreciate it. I used to be suggested this website via my cousin. I’m now not positive whether this submit is written by means of him as nobody else know such detailed about my trouble. You are incredible! Thanks! It’s going to be finish of mine day, however before end I am reading this enormous piece of writing to increase my experience. However, the third party might not accept the claim and fight for it. Hi, I do believe this is an excellent site. I stumbledupon it 😉 I may come back once again since I saved as a favorite it. Money and freedom is the best way to change, may you be rich and continue to help others.